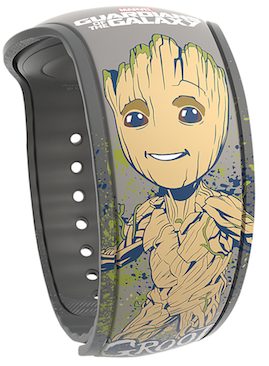 A new Guardians of the Galaxy teenage Groot and Rocket Raccoon MagicBand is now out. This one is Open Edition and comes in Marvel themed packaging. The price is $22.99 and the barcode SKU is 400020783646. It’s probably no coincidence that this band was put out for sale the same week as the new Avengers: Infinity War movie hit theaters. 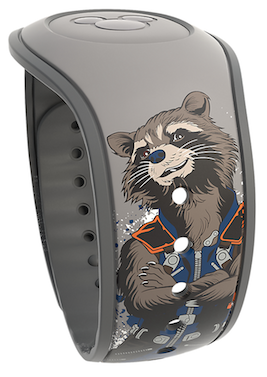 This band isn’t yet available online and you can only find it in the theme parks. I was able to find this one at The Dark Room in Disney’s Hollywood Studios. I expect that it will be available online soon, and when it is I will update this page with a link of where you can buy it. One Response to "New Guardians of the Galaxy Groot and Rocket band out"
This one looks awesome. Might have to make it my 10th band!